NETWORK FINALS: The rerun of MOM gained 0.1 in final numbers, while THE PROPOSAL lost the same. CABLE HIGHLIGHTS: VH1’s LOVE & HIP-HOP led Monday cable, up 0.03 to 1.05. USA’s WWE telecast was at 0.93/0.93/0.91, compared to last week’s 1.03/0.95/0.90. Discovery’s SHARK WEEK line-up featured GREAT WHITE ABYSS at 0.82, CUBA’S SECRET SHARK LAIR at 0.76, MONSTER TAG at 0.65, and SHARK AFTER DARK at 0.36. 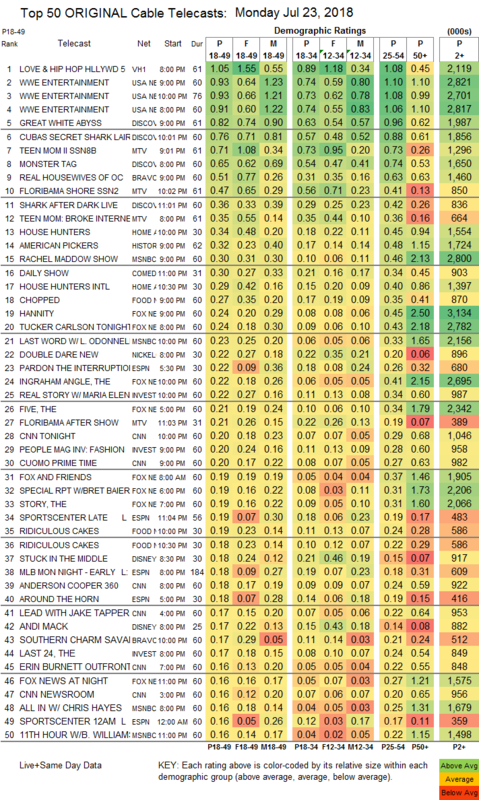 On MTV, TEEN MOM rose 0.08 to 0.71, FLORIBAMA SHORE was up 0.03 to 0.47, and the TEEN MOM pre-show was at 0.35. On Bravo, REAL HOUSEWIVES OF ORANGE COUNTY dipped 0.03 to 0.51. On HGTV, HOUSE HUNTERS gained 0.06 to 0.34, and HOUSE HUNTERS INTL grew by 0.03 to 0.31. History’s AMERICAN PICKERS climbed 0.08 to 0.32. MSNBC’s RACHEL MADDOW SHOW led cable news at 0.30/0.46/2.8M, with Fox News’s HANNITY at 0.24/0.45/3.1M, and CNN TONIGHT at 0.20/0.29/1M. Comedy Central’s THE DAILY SHOW hit the Top 19 at 0.30. Food Network’s CHOPPED was at 0.27, and RIDICULOUS CAKES was at 0.19/0.18. On ID, THE REAL STORY edged up 0.02 to 0.22, PEOPLE MAGAZINE INVESTIGATES ticked up to 0.20, and THE LAST 24 remained at 0.17. On Lifetime, ESCAPING POLYGAMY slipped 0.02 to 0.15. 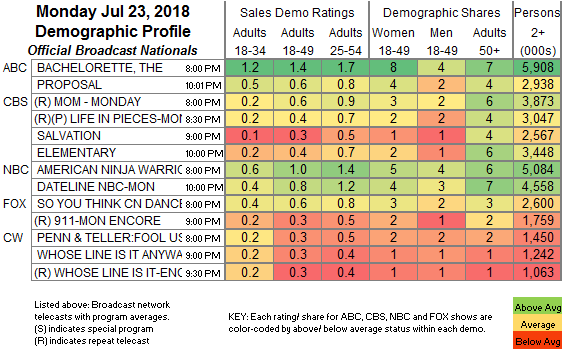 On AMC, DIETLAND lost 0.02 to 0.06, and UNAPOLOGETIC stayed off the chart, down 0.01 to 0.02/95K.